The word giblets (pronounced with a soft "g" as in the word "ginger") refers to the necks, hearts, livers, and gizzards of poultry, mainly chickens and turkeys. These items are often (but not always) packaged up and included within the body cavity of a whole chicken or turkey. Sometimes the kidneys will be in there too. An interesting fact about that bag of giblets: The organs and neck found in that bag may not be from that particular chicken or turkey. Although, if you get your bird from a farmer, it may be. And, because so many cooks just do not know how to handle them, a lot of factory-farmed chickens do not even include the giblets any longer. In earlier times, in addition to necks, hearts, livers, (sometimes kidneys) and gizzards, the term giblets also referred to such items as the feet, wing tips, heads, and even that floppy red thing on a rooster's head called the cockscomb. Today, there is a fringe notion that the word giblets only refers to edible organs, relegating the unfortunate neck to the status of an interloper. And yet, there it is in that little bag. Wing tips (the pointy, flappy section of the wing) and chicken feet are excellent for making chicken stock, and both are a delicacy in some Asian cuisines. As for the head and cockscomb, it is not clear what happens to those parts now, but a good guess would be as ingredients in pet food like chicken or turkey by-products. No discussion of giblets can possibly be complete without addressing the question of what, exactly, is a gizzard? 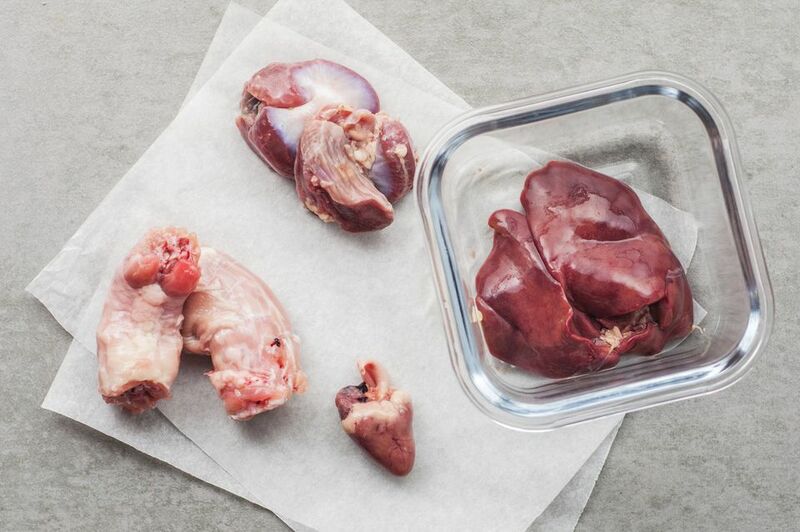 Gizzards are a digestive organ that helps to grind up the food eaten by the animals who possess them (chickens, turkeys, and ducks, as well as other animals like penguins and crocodiles). A chicken swallows tiny pebbles and bits of grit which are stored in the gizzard, and when food comes through, the muscular gizzard squeezes and contracts, causing those stones to grind up the food. Duck gizzards are classically used in making confit, although duck liver is not considered giblets since it, like goose liver, is highly desirable for making foie gras or pate. In classical cuisine, giblets would be cut up and simmered until tender, usually with potatoes and onions as well as other items such as carrots, garlic, and bacon. Alternately, they may be dusted in flour and then browned in butter before simmering in wine, and then chopped up and used in a number of sauces. The cooked meat is removed from the neck bone before adding it to the sauce or another dish. Turkey giblets à la Bourguignon was a classic preparation in which the giblets are simmered in red wine along with onions and mushrooms. A common preparation today is adding the cooked and chopped giblets to gravy or stuffing or even pasta sauce. Giblets can also be battered and deep-fried, but of course, most people only have the giblets that came in whatever bird they are preparing, which makes for a scant serving. Of course, if you find that deep-fried giblets are for you, you could always stockpile them in the freezer until you have enough to make cooking them worth your while. Defrost them in the fridge overnight and you will be good to go. When cooking giblets, it is important to set the liver aside until the last 10 minutes of cooking, otherwise, its flavor will overpower the dish. Or better yet, dust the liver in flour and pan-fry it in butter and garlic or grill it on a skewer. As with all uncooked poultry products, always use care when handling the raw giblets as they can be a cross-contamination hazard.